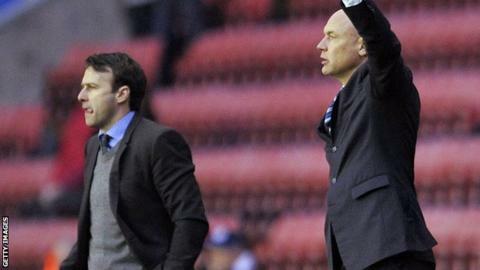 Bolton manager Dougie Freedman was unhappy with Wigan's players following his side's 3-2 loss at the DW Stadium. Referee Kevin Friend appeared to award a corner before altering his decision and giving a penalty in the build-up to Wigan's first goal. "The referee gets surrounded by five or six Wigan players and has changed his mind, that is what disappoints me," Freedman told BBC Radio Manchester. "In the rules, that is not on. That is not in the spirit of the game." The home side went in front through Ben Watson's opener, as Friend initially ignored the hosts' appeals only to point to the spot on the advice of his assistant, before Nick Powell netted the second. Bolton hit back through Neil Danns and Andre Moritz's penalty, but Callum McManaman struck the winner in Uwe Rosler's first league game in charge. "You will get some [refereeing decisions] right and some wrong. I accept that, but I am disappointed in the perception of it," Freedman added. "Referees have a hard job but for him to give a corner with players around him and change his mind is the problem I have got. The second goal is offside and has the emotion carried on [from the first goal]?" Latics boss Rosler was delighted to gain his first victory, having replaced Owen Coyle who left the club by mutual consent. "It was a great occasion, I couldn't have asked for a better atmosphere on my debut," said the former Manchester City and Southampton striker. "It was a great win and shows the character of the boys with their backs to the wall. They did magnificently to dig in and secure the three points."